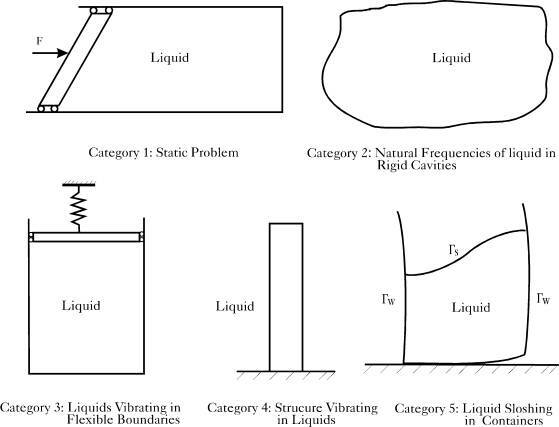 In general, liquid-structure interaction may be divided into five categories. Each category requires specific formulation and unknowns that may not be suitable for others. As shown in Figure (4.1), category five is characterized by the free surface existence, which combines the sloshing phenomenon with the liquid-structure interaction. The free surface may also be viewed as a structure boundary for the liquid, but with zero stiffness. Since this structure boundary can not take any force, the liquid pressure has to be eliminated on this boundary in order to fulfill the equilibrium conditions. The virtual work statement that is used to describe the nonlinear liquid sloshing in either anchored or unanchored tanks (category 5) is developed in this section. 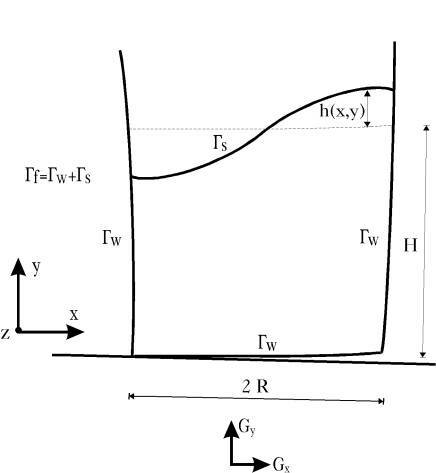 Figure (4.2) shows the general geometry of a liquid sloshing in an unanchored tank. It should be pointed out that unanchored tanks are characterized by the successive contact and separation between the tank base plate and its foundation. The nonlinear boundary conditions that result from this behavior are enforced separately by means of the contact analysis presented before. Thus, the formulation presented in this section is independent of the tank support condition. This property of the current formulation allows it to be used in the analysis of various liquid storage tanks with different support conditions, such as anchored, unanchored and elevated tanks. Also, the formulation is not restricted to containers with vertical walls but rather allows the modeling of tanks of any shape.